While we are not landscapers, we do realize that some plants make sense to place near a pool while others can make a giant mess. The last thing you want to deal with is a lot of leaves and berries or seed pods clogging up your system. As part of the process, we imagine you are looking to enhance the look of your backyard oasis as you luxuriate in your new pool. Getting the landscaping in place before plastering the pool is ideal, you don’t want dirt blowing into your new pool and staining it. If you are looking to install some new plants, or looking to pull out some potentially problematic foliage, we have some ideas for you. If you are looking for trees, you might want to consider Queen Palms, Mediterranean Fan Palms and Sago Palms or fruitless olive trees. For smaller plants, a wide variety of succulents (aloe, agave, yucca, aeonium rosettes, etcetera) work, as well as Papyrus, Bird of Paradise, Fortnight Lily and Day Lily. Hibiscus is a classic for Hawaii and agapanthus can grow up to 2 foot stalks with lovely blue flowers. Bushes to consider would be Powder Puff trees (calliandra) or Butterfly bushes (buddleia). Golden Euonymus would be a good option. Groundcover ideas would be Ilima Papa, Akia, Wedelia and Ala’alawainui. While regular bamboo is not a good idea, Heavenly Bamboo (which is not actually bamboo) is non-invasive and a good screen for privacy and to cover pool equipment. If your equipment is in a shaded area, you might want to consider Japanese Aralia. In more sunny locations, banana trees, Bird of Paradise trees and the golden euonymus are examples of foliage to be considered. Some of the plants you want to keep away from include Acacia, Azaleas, Bamboo and Bougainvillea; these all are too messy to have near your pool. Anything with large seeds or that loves to drop leaves should be avoided. While flowering plants will eventually drop their flowers, but it is hard to give up those pops of color! Large pots of flowering or non-flowering plants placed near the pool provide a great aesthetic and can give the pool area a polished, finished look. By working with a professional landscape designer, you will find the plants that turn your backyard into a relaxing resort. At Huber Pools, we strive to make the process as smooth as possible and enjoy turning our client’s dreams into reality. Each year the National Swimming Pool Foundation (NSPF) determines the recipients of their Step Into Swim™ Campaign, a 10-year initiative which began in 2012 to create one million more swimmers. Through the generosity of donors that support the Campaign, NSPF was able to direct $78,750 to Angels of America’s Fallen, EVO Swim School, Jewish Community Center Association, New York State Parks, Swim Today, YMCA, and 14 individual learn to swim programs selected by Master Pools Guild Members. One hundred percent of the donated funds are utilized in learn to swim programs, and NSPF covers all administrative costs. Master Pools Guild (MPG) members, which Huber Pools is a member of, are craftsman, operating with a strong commitment to high quality, customer service, and good business practices. MPG allocated $10,000 of their donation to support local learn to swim programs by MPG members. Huber Pools is proud to announce a gift of $700 to the Maui Family YMCA, in support of their Learn to Swim program. We understand the importance of teaching children to swim from both a drowning prevention perspective as well as from a health and happiness standpoint. Overcoming a fear of water and mastering skills in the pool builds confidence and competence. That’s why the Safety Around Water program, like all YMCA programs, is designed to help individuals reach their full potential. Last year alone, the YMCA taught more than 600 kids and adults about water safety as well as teaching them to swim. If you would like to support the NSPF Campaign, please visit stepintoswim.org or, for local contributions, contact mauiymca.org. Are you toying with me? Summer’s in full swing and you’re loving your pool! You’ve spent countless hours swimming laps and hanging out on pool floats. But one day, you decide that something is missing. You want that something extra to use in your pool that takes the aquatic experience to a higher level. Depending on the type of activity that appeals to your personality and interests, there are a number of options available. Whatever you’re into, chances are there is a pool accessory out there that’ll make your days in the pool an even more fun with family and friends. After all, isn’t that what summertime is all about? When you think of the 3 R’s, what comes to mind is reading, (w)riting, and (a)rithmatic. With pools, we think remodel, replaster and repair. Often times all three of these might be involved in one project. As you pool ages, just like people, it may need a facelift to keep it looking good. Adding a spa, reconfiguring the size and shape of your pool, adding an infinity edge or water feature are very typical requests for a remodel. Or, you might be looking to add a Baja shelf, a fire pit, or change the coping around the pool. Keep in mind, though, that a significant remodel can cost as much as a new pool once demo, more excavation, reforming, a new pool shell, new plaster and tile are factored in. Having said all that, a remodel that will increase the enjoyment and usage of your pool might be well worth it. As we discussed in a previous article, Marcite plaster can degrade over time. Hydrazzo has a 10 year warranty, and although we’ve never seen one fail, you might still want a change of color. With a replaster, the waterline tile is often bead blasted to remove built up scum. 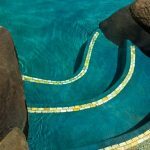 If tiles have popped off and cannot be matched or you simply want a new look and feel to the pool, this a great time to change out that waterline tile to something that fits your new vision for the pool. Repairs can be simple or extremely complicated. For example, trying to find a leak can be complex and costly. Reattaching a couple of tiles or changing a light is much less of an issue. Sending us pictures of any issues can usually allow us to give you an idea of budget and timing for your project. These can be sent to info@huberpools.com. We look forward to helping your pool look it’s best once again! One of the hottest trends for backyard pools is actually on fire! 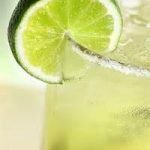 Although the thought of fire and heat may be a bit much for some folks on Maui to wrap their heads around, it is a feature that we are seeing more of. Especially in areas like upcountry where the nights get a bit cool, fire can bring warmth (and romance) to your backyard. Fire pits can be found integrated into the center of a sitting area inside or connected to the pool. Fire bowls are showing up on the sides of pools—even mounting them so they look like they are floating in the pool. Fountains and waterfalls are getting in on the act with juxtaposition of water and fire. Fireplaces are springing up near pools so that the view of the water can be enjoyed while staying warm and cozy. On the practical side, using a wood in your fire vessel will provide the most heat. Propane use will give less warmth but can still offer the ambiance you’re looking for. Whatever your thoughts on adding the dimension of fire to your project, we’re here to help make your dreams a reality! 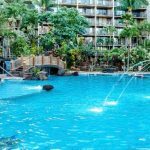 Before a pool can be built in Maui County, a Builder’s Permit must be obtained from the County. Since you will need 8 sets of plans drawn to scale with site details, cross-sections and stamped by a licensed architect, finding an architect you like and can work with is usually the first step. We have several we can recommend who understand the process for pools. Special inspection forms and grading permits may also be required. Getting the plans and permit submittal package together generally takes 2-4 weeks. In some areas, a farm plan must be included and implemented—oftentimes someone from the County will come out to ensure it’s been done. If you live close to the ocean, SMA (Special Management Area) permit or Shoreline Setback Variance must also be applied for. These are designed, of course, to protect our beautiful coastline. These types of permits can easily take 4 months or longer to work their way through the system, but are important to preserve the natural resources of Maui. If your land doesn’t require any of these, the process usually takes 2-4 months—but depends on how backed up the County is for approvals. If you are also in need of approvals from your HOA, this can be done concurrently with the County approval process. Once the building permits are issued, the electrical and plumbing permits can be applied for. These generally happen pretty quickly. We can usually begin working on your pool during this time, but can only go so far before needing these permits in hand. Copies of the permits and plans should be kept on-site at all times. During the build, we will be calling for inspections by the Building Department, Electrical Department and Plumbing Department. These inspections ensure that we are building the pool according to code. Additionally, the architect might require special inspections to ensure we are building to their specifications. Both your architect and Huber Pools can help you through this process. We will also keep an eye on your permits and gently nudge them along if possible. Knowing the lead time can help you plan ahead to have your pool built during the time frame you need. For more information, check out the County of Maui website at http://www.co.maui.hi.us/1208/Building-Permit. At Huber Pools, while we are search for the right equipment solution for your needs, we often recommend Pentair. As a result, we have been selling quality Pentair products to our customers for a very long time. We find them to be well-built and long-lasting as well as quiet and easy to operate. If you do run into an issue, we have an on-island Pentair representative, Aquapulco Pool Service, who can assist with any necessary repairs or warranty replacements. Depending on the item, warranties run from 1-3 years. Product registration forms are included in your pool owner’s binder which explains the details; just fill it out, send it on in and your equipment is covered. You will also find the instruction manuals for the various pieces of equipment used for your system in that binder. With over 50 of manufacturing expertise, Pentair continually updates their products to reflect new technology and improvements in efficiency. For example, in addition to iPad and iPhone compatibility, they recently added control automation to both the Apple Watch and to Amazon’s Echo system. Their variable speed pumps outsell all other similar pumps combined. Many of their products are Energy Star Certified and can save you thousands of dollars annually. We are committed to supplying these types of quality products and equipment to our customers—we have found Pentair meets and sometimes exceeds our expectations. We’re happy to answer any questions you have about the Pentair products included in your proposal/contract. Another design element of your pool is the lighting within and surrounding your pool. Again, look to the overall effect you are trying to create and then which options will get you there. LED lights are the most popular; they are much more energy efficient than the old halogen lights. These LEDs come in single bulbs, strips and even floating lights. You also have the option of either white or color changing lights. We install primarily Intellibrites or Globrites manufactured by Pentair. Globrites are smaller with lower power. Often these are used on shallow shelves, steps and beach entries. Additionally, you can use a greater number of them to more evenly distribute the light around the pool to prevent shadows. A great feature on the white Globrites is that they are dimmable; the color ones are not. 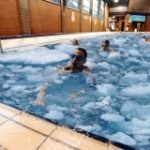 Intellibrites are much brighter and generally used for the main part of the pool. In smaller pools, only one may be needed, but having at least two can help to eliminate shadows. Larger pools may need even more. Several lights along one side of the pool may give you the effect you need or placing them opposite each other may be better. Intellibrites also come in both white and in color. They have either fixed colors or standard light shows. The fixed colors are blue, magenta, green, white and red. The light shows include party, romance, California sunset, American, royal and Caribbean modes. Automated control systems such as the Intellitouch, Easytouch or Screen Logic systems allow you the ability to program and/or manually adjust your lights. Some of these systems are wall mounted; others can be accessed by your phone. Surrounding the pool, you’ll want to think about lighting the pathway to the pool for or placing lights in the surrounding trees for both safety and ambiance. Both inside and out of the pool, you’ll want to take care in aiming lights away from the seating areas—no one likes to hang out with lights shining directly in their eyes. We can work with you to design the proper lighting to fulfill your needs. The first is plaster, also called whitecoat or Marcite, which comes in grey or white, and is a very basic finish for a pool. It should last 5-6 years, but then the pool will need a complete replaster. Plaster stains fairly easily and acid washing to rid it of stains causes deterioration of the plaster and therefore roughness. Algae can also adhere to the surface easily. Since the surface is porous and reactive, high chemical usage can cause the water and chemicals to react with the plaster. Marcite is the least expensive option in the short term, but can become the most expensive in the long run, especially as it only comes with a 1 year warranty. On the other end of the spectrum is Pebble Tec. It is made of a high quality, durable and long-lasting finish and looks naturally beautiful under water and comes in a variety of colors. Unfortunately however, those pretty lumps of aggregate cause people to often complain of bloody toes and ruined swimwear. The crevices can be hard to keep clean of algae and stains can make the plaster permanently blotchy. Our favorite here at Huber Pools is Hydrazzo. Its smooth texture is friendly to fingers, toes and swimsuits, but still gives you that look of aggregate under the water. It can be polished and patched if needed and those areas would be difficult to pick out. Huber Pools is a certified installer of Hydrazzo and it comes with a 10 year warranty on residential properties. Colors can range from Maui Midnight to lighter grays, to sage or rose, to many shades of blue. 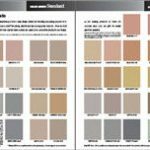 The color you pick primarily depends on your overall vision for your space. Visit our showroom to view the wide range of colors available. Your coping caps off the edge of the pool—it’s that place to hang onto, climb in or out of the pool on, or set your drink on. This cap is mounted on the pool’s bond beam and covers the steel that forms the pool and the pool’s concrete edges. It also prevents water from getting behind the gunite shell and wreaking havoc. Sometimes it leads into a deck or lanai area or sometimes it stands alone. There are, of course, several options for coping. Again, the look and feel of your design should come into play as well as your budget. Poured concrete is an inexpensive way to go and comes in a variety of colors. It is normally about 3.5” thick, can be of various finishes – smooth, broom, or salt. For an upgraded look, you can also stamp the concrete to give it an interesting and unique look. Concrete can also be poured “smooth” in order to have tile set on top. Precast concrete comes in a variety of textures, patterns and colors. These are more uniform looking and are easy to maintain. You can get straight, corner or multiple radiuses to work with your pool design. 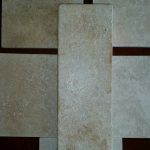 Natural stone can give you an option that is skid resistant. 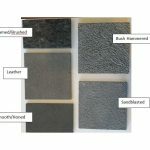 Options include stones like basalt, granite and travertine and typically come in 4 x12, 12 x 24 and 16 x24 sizes. Typically these are available in 1.25” – 2” thicknesses. The benefit of this type of coping is less height above the water. In our opinion, pools look better when the water level is closer to the deck height, and it is an easier step down into the pool with the reduced height – 2” less of a step into the water. These stones are available honed, brushed or tumbled and have either a saw cut edge or bullnose. The small pores in the stone help reduce the heat on the feet. If you have a lot of radiuses, however, this is probably not your best bet—it’s much more difficult to work with in that case. Whatever you have in mind, our showroom has a wide variety of options to look at. No need to worry – we’ll help you cope with all the options and pick the one that will work best for you. Options abound—there are fountains, waterfalls, deck jets and caves to name a few. Deciding what will fit with your vision and the space available is the first step. Then you need to consider the outcome desired; some features can help cover road noise; some can block unsightly neighbors; some can just sooth and relax you on a stressful day. Let’s tak e a closer look at some of these options. Sheer descents are very popular, especially with a more modern, sleek look. These arcs of water spill out from a wall—the longer the fall, the louder the water sound will be. The pool will need a raised beam or deck to support the wall and the sheer descents. 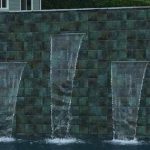 For a smaller amount of water cascading from a wall, scuppers, which come in a variety of shapes and sizes, can be utilized. Roc ks can impart a more natural feel around your pool. These can either be purchased prefab, can be custom made, or a combination thereof. Many parts of Maui are very rocky and these rocks from your own yard may be incorporated. 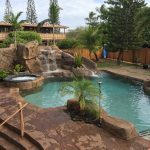 You might be thinking of a small waterfall or perhaps you’re thinking of something larger to include caves, grottos or a waterfall slide. You’re only limited by imagination…and perhaps that pesky budget. Another direction would be to add deck jets or bubblers. Deck jets can offer an individual arcing stream of water coming off the deck. Bubblers can be added to baja shelves/tanning ledges or beach entries. All that’s required for bubblers is 6” of water. We can share examples of all of these with you—many are available on our website or we can visit our showroom to see more. Other websites such as Houzz and Pinterest can also fuel your imagination. The possibilities are endless! Things are heating up all over! Living on Maui, we know that our year-round temperatures are pretty moderate. However, it does get cold upcountry and even the south shore can get a bit chilly in the winter and sometimes the pool gets just a bit too much shade. Additionally, you might want to take that early morning swim or late night dip. To ensure your pool can get used all year long, many people add a heater to their pool equipment list. There are basically three options when it comes to heating your pool; propane, electric heat pump, or solar panels. Electric heat pumps take longer to initially heat up the pool and must run continuously to maintain the temperature. The equipment is a bit more expensive to start with, but the ongoing cost is lower. And, if you have photo-voltaic panels, the cost becomes even lower. Passive solar is something we don’t generally recommend for pools for a couple of reasons. The first is that you have to create a very large solar field (about a 1:1 ratio for the square footage of the pool). Secondly, it takes a long time for the pool to heat up and just about the time it’s starting to get to a perfect temp, the sun will set and there goes your heat! We’re happy to discuss all the options for your particular project and see what will work best to keep you swimming throughout the year. Let’s keep the chillin’ to the side of the pool! For years the only choice for sanitizing pools and keeping the water crystal clear was to add chlorine tabs on a regular basis. The pool would also need to be “shocked” once a week with additional concentrated chlorine. What a hassle that was—having to buy, transport and store the tabs and shock treatments. Your bathing suit would get all bleached out. Your eyes would sting and your skin would be easily irritated. As a result, salt water pools have become more and more popular as many new pool owners add a salt chlorine generator as part of their equipment package. While the upfront cost is greater, it quickly pays for itself since you no longer need buy all that chlorine. The generator manufactures the chlorine as water and dissolved salt flows through the generator cell. Through electrolysis, the salt is then converted to chlorine, which is returned to the pool. Once the chlorine has finished purifying the pool of contaminants, it reverts back to salt and the cycle repeats. The result is soft, silky water against your skin—no more odor or irritations! At Huber Pools, we recommend the Pentair Intellichlor System due to the ease of use and the durability of the system. Additionally, if there is ever a problem, we have a Pentair rep here on island to assist with repair or warranty issues. You can even add a Pentair Intellitouch or Easy Touch automation system to control everything for your computer or phone—more on those later. In the meantime, save a bit of salt for your cocktails by the pool…. 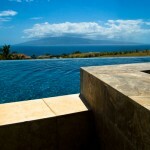 We’ve all seen the picture—an infinity edge pool that seems to blend into the horizon with a stunning view beyond. And if you’ve experience one at a high end resort, you may be thinking that’s the perfect addition for your backyard pool. After all, you’d be in good company; the first known infinity edge was created at the Palace of Versailles in the 1600s. These types of pools go by various names; negative edge, zero edge, infinity pool, disappearing edge or vanishing edge pool. Regardless of the name, if your property has a breathtaking view beyond your yard, you may want to consider it. To build this type of pool, one edge is lower and is tiled, with the pool water level kept to the top of the edge. A trough is built below to catch the water or a surge tank is created to hold the excess water to pump back into the pool. An infinity edge, however, does not come cheap. They require substantial structural, mechanical and architectural detailing as well as a pool builder that knows what they’re doing. After it’s built, it will continue to be more expensive requiring a separate pump that will need to run either on demand or for a predetermined amount of time. Additionally, the pool cannot be covered, which means more water evaporates as it falls over the edge. Lastly, children need to be monitored more closely so they don’t fall over the edge. Having said that, the look and feel of the infinity edge is amazing and allows you to really get the feeling of an incredible “staycation” whenever you spend time in and around your pool.